This petition serves a vital mission to remedy a seventy-year-old injustice: to ensure that one of the greatest, yet least-known American heroes of World War II, Lt. Col. William Edwin Dyess, U.S. Army Air Forces, the namesake of Dyess Air Force Base in Abilene, Texas and the 2015 recipient of the Texas Legislative Medal of Honor, is ultimately recognized with the highest military award the United States can bestow, the Medal of Honor. 4) The only successful large-scale Allied POW escape of the Pacific war on 4 April 1943; this escape and the subsequent adventures of Dyess and his 11 comrades was later called The Greatest Story of the War in the Pacific by the U.S. War Department. Dyess achieved the rank of lieutenant colonel at the young age of 27. But the extent of his heroism cannot be measured exclusively by his battlefield bravery. Despite suffering from exhaustion, malnutrition and disease, Dyess flew countless evacuation, reconnaissance and resupply missions from the time period January through April 1942. Near the end of the Battle for Bataan, when food was scarce, the pilot refused to accept special flight rations as ordered by his superiors without first receiving permission from his enlisted personnel. He refused several opportunities to evacuate Bataan before the surrender and instead ordered others to go in his place. As a prisoner of war, Dyess remained conspicuously in command throughout 361 days of captivity in hellish conditions. He presented himself as a target for abuse during the infamous Bataan Death March to deflect attention from his men as well as sick and wounded comrades. In three squalid prison camps, despite suffering from malnutrition and disease himself, he employed his innate leadership skills and charisma, engaged in morale-building activities and endeavored to secure food and medical supplies in order to improve the living conditions of his fellow prisoners, in the process depriving himself of these essential items. When Dyess returned to the U.S. following his epic escape, he was not afforded a homecoming of a hero. Instead, while suffering from what had yet to be diagnosed as post-traumatic stress disorder, he was muzzled by the U.S. Government and threatened with the loss of his career and criminal proceedings, compounding feelings of survivor guilt and causing severe emotional distress from his perceived inability to help his comrades in captivity. In what would be his last, and perhaps greatest mission, Dyess waged a top secret fight against the U.S. Government and wartime censorship restrictions to break the news of Japanese atrocities to the world. "The thing I must do – the thing I'm going to do – is to tell the American people what the Japs have done and are doing to their sons and husbands and brothers out in the Philippines," Dyess said. "I want the American people to understand Japanese psychology and the way they make war. I am going to tell my story." He did. Called "The Greatest Story of the War in the Pacific" by the U.S. War Department, the story awakened America to a renewed effort to win the Pacific war in early 1944. But Dyess never lived to know that his collective efforts changed the course of World War II. During a routine flight over Burbank, California On 22 December 1943, the P-38 Lightning fighter plane he was piloting began experiencing engine trouble. Rather than bail out and let his aircraft careen into a heavily-crowded residential area or war plant, Dyess attempted an emergency landing on an empty street. At the last moment, a lone car appeared, forcing Dyess to pull up and abort the landing. The choice to save the life of the unknown motorist essentially cost Dyess his. Though rapidly losing altitude, he miraculously crashed the plane into a vacant lot and was killed instantly. 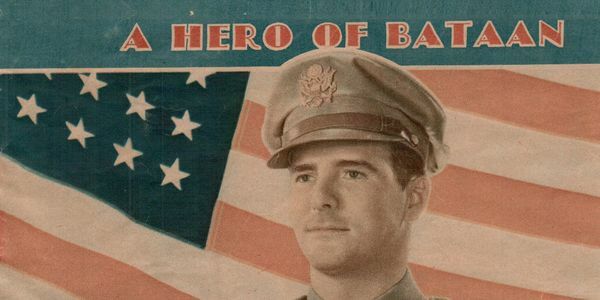 For this final, remarkable, unselfish act of heroism, Dyess was recommended for the Medal of Honor, but he instead received the Soldiers Medal, symbolic of heroic action committed not in the face of an armed enemy. Dyess had the tragic misfortune of accomplishing so many heroic deeds as a combatant in a lost, forgotten battle, a fight in which all of his commanding officers (who were needed to recommend him for awards) were killed and in which key records were destroyed to prevent them to falling into enemy hands. As a living reminder of the abandonment of the Philippines by the United States and a messenger whose firsthand testimony of that battle and its hellish aftermath was potentially poisonous to the Roosevelt Administration and the Allied Europe First strategic policy, Dyess was denied the ultimate recognition he deserved by a powerful, vindictive president and Washington officialdom for punitive political reasons. But now, nearly seventy-five years later, a mission is being undertaken to ensure that the memory of his extraordinary life and military service is enshrined in the national consciousness of America and that his name assumes its rightful place in the special pantheon of American military heroes who have been decorated with our most prestigious award for valor. In honor of the 26,968 American prisoners of war (as well as the undetermined thousands of Filipino POWs) taken by the Japanese in the Philippines, and in symbolic recognition of Dyess' burning passion to have their service and sacrifices recognized, and their suffering alleviated, it is our goal to secure 26,968 signatures in support of this mission. It is both a matter and a Mission of Honor. Due to some upcoming airings of "4-4-43," we're re-opening the petition through Pearl Harbor Day and closing it officially in December 2018 prior to the beginning of the Pentagon's review process for the Medal of Honor in early 2019. Please tell friends and family! We're extending the petition through National POW/MIA Recognition Day on September 21, 2018. Please continue to tell your family and friends to support Lt. Col. Dyess - THANK YOU!! THANK YOU!! We reached our goal of 26,968 signatures on the public petition to secure the Medal of Honor for WWII hero Lt. Col. Dyess! Together - our ranks include 12,000 Texans, signers from all 50 U.S. states & territories, the Philippines & more than 40 countries worldwide - we took a giant step toward our ultimate goal today. The petition will remain open until 4/4. Updates to the mission will be provided via this list and on 4-4-43.com.